Below the S&P portrait of the rally from March. 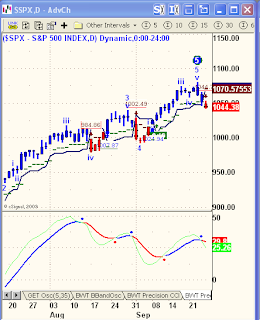 Advanced GET labels this 5-wave sequence a Wave 4 on the Weekly chart that portends an approaching Wave 5 down to new lows. 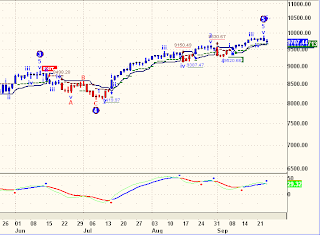 Prechter labels this a Wave 2 rally that is right now transitioning into a Wave 3 down. 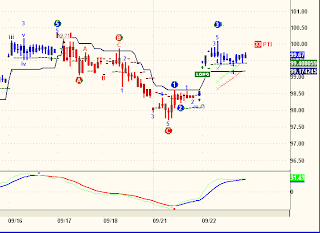 Glenn Neely is labeling this a NeoWave Neutral Triangle, a completed B-Wave up preceding a Wave C down. I am calling this an opportunity to profit from the imminent collapse of our planet's global financial structure. 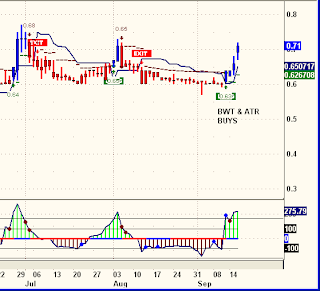 You can see that the Daily BWT and ATR Sell signals are still in tact. 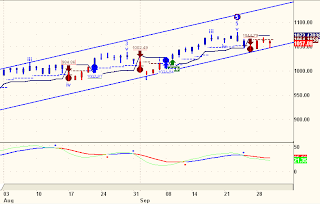 You can also surmise the implication of prices breaking down out of that channel. Here is another scary short term chart, I don't remember what time frame this is, who cares, this is nasty, nasty, nasty. Some time trends flipped back to Buys on Monday, but Monday was Yom Kippor and prices were easy to manipulate in a mostly unpopulated exchange. 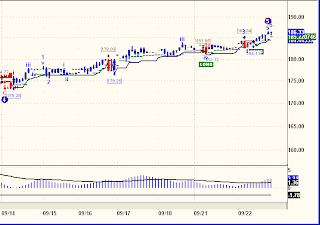 Tuesday reversed some time frames back to Sells. October is only 48 hour away. As someone just posted under "106" blog, follow the trend, not the forecast, but what I am saying to all of you tonight is that I expect the trend to turn down in a harsh and historical way, any day now, any time now. 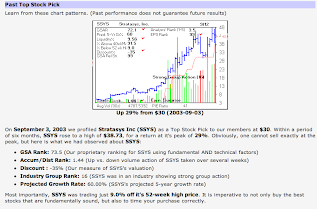 Here is an SPY screen shot from my trading platform. Prices are gravitating around 106 and confirming the importance of this level. A base for the shot at new near-term highs? Or a platform for a forward 2 1/2 somersaults in the Pike Position? With all of the atoning and forgiving and promises now over with, thoughts turn toward a new beginning, a fresh start, fueled by lessons learned, by love lost, by mountains climbed and by yet another year lived and gone. Icy stare of time, perpetual and numbing, passes through and leads along a well trodden path. Hope and dreams are running out of time. Are they still ahead, or has it all been left behind? In the suddenness of life, changes spring with steely-eyed fortune. From a feeling deep, deep inside, falling under the beauty and grace of her warm hand in mine, breathing softly and holding tightly beside me. Growth Stock Analytics is based in Ann Arbor, Michigan, which is probably all we need to know about this service, since Michigan is undefeated this year and since yours truly is a member of the Class of 1971. For those still laboring with a stiff dose of skepticism up their behinds, let's take a closer look at what these guys offer traders and investors. They run a number of strategies based on proprietary methodologies centered around high EPS and Relative Strength stocks. This is the same market approach espoused by William O'Neill and Investors Business Daily, Louis Navellier and Modern Portfolio Theory. In a nutshell, isolate common characteristics of insanely successful stocks, i.e. 10 baggers, apply those characteristics to your database and then focus on those stocks that land at the top of the heap. GSA combines bullish and bearish patterns and not afraid to SHORT stocks showing characteristics consistent with falling prices. 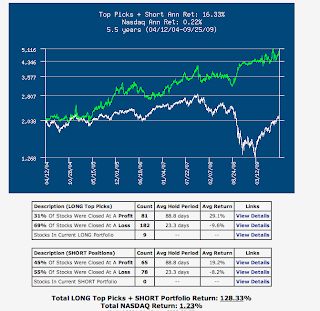 The combination portfolio has an outstanding track record fully documented on the site. 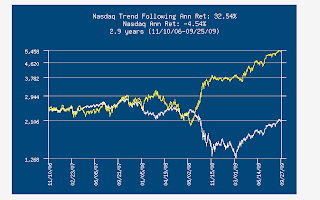 Their "Top Picks & Shorts" portfolio has returned 128.33% since April, 2004, compared to a return of 1.28% for the same period in the NASDAQ. What is impressive about this record is that the period includes a wide range of market bias, from strongly bullish to choppy-neutral to strongly bearish. There are numerous other features of this service, including an interesting Trend Following Model that has returned an average of about 33% per year over the past three years. In addition, the GSA database screener is extremely user friendly for do-it-yourself types who prefer their own stock selection using breakouts, gaps, base breakouts, earnings accelerating, or even extended stocks-Short as filters. All of the above can be filter further between short-term or swing selections. There is a one month trial available and after that annual subscriptions are a reasonable $199 with quarterly and six month subscriptions available. 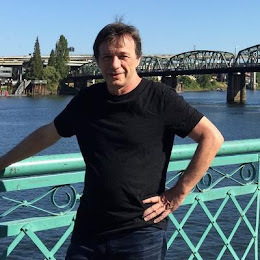 I've been meaning to write up this service for several weeks because it is a relatively unknown source of trading ideas and models, is inexpensive and is in my stable of tools. Take a trial and see what you think, "There's always an idea, somewhere." 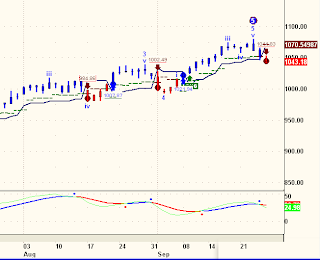 As anticipated on Friday, a Sell signal was generated by both BWT and ATR. A Sell signal was also triggered on the Nasdaq 100 by BWT and the index is only 1 point above the trigger level for an ATR Sell. 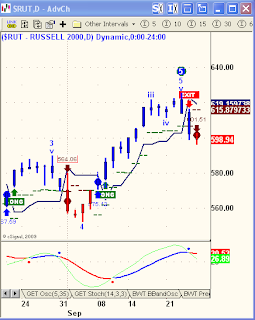 The Russell 2000 is already two days in to a Sell on the ATR and a fresh BWT Sell was triggered on Friday. The take away from the above three charts is that the market has entered a down trend. As long as these Sell signals are in effect, the path of least resistance will be lower. 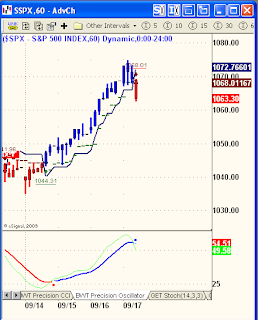 Next major hurdle will be Weekly Sell signals which will come at lower levels. The same message is being displayed on the Market Club S&P chart, currently under the influence of a Daily Sell Triangle, but with still outstanding Weekly and Monthly Buy Triangles. Again, the take away is that all intra-day through Daily models are on Sells, but longer-term models have yet to turn bearish. That said, Prechter's forecast that this is the beginning of the worst of the bear market in terms of severe market declines is beginning to take shape. This doesn't prove his forecast is correct, only that if it is correct, the market is behaving the way it should. We all want to make a killing on the next market crash. The best way to do this is to be SHORT when the next crash occurs. The market should be weak enough in the days and hours going into a crash that if we are following the trends, we indeed will be short. What we don't know is when the crash will occur and in fact, we don't even know if there will be a crash. How much money have you lost over the years betting on a crash that never happened? This is the beauty of using tools like those above to identify trends. They have a knack for placing the trader in the right place at the right time. In other words, we are not guessing that a crash is imminent. 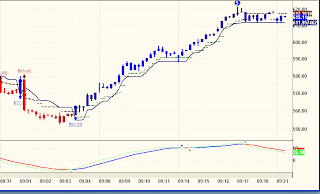 We trading a trend that is pointing lower. Wherever that path takes us will be our fate. True atonement is learning, healing and loving. 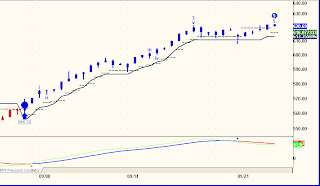 The SPX has triggered SHORT on the Daily chart. It's still about 40 SPX points away from triggering SHORT on the Weekly. 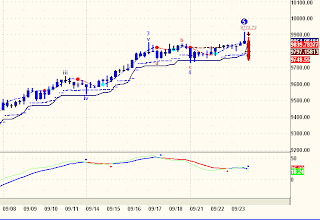 In order for the Daily Short signal to be confirmed, SPX must close today below 1045. 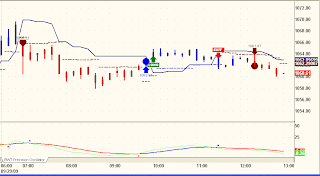 Needless to say, all of the intraday models are currently SHORT. How different are the Elliott Wave Principle and the philosophy of determinism? Given that the Principle teaches that the financial markets and the culture at large are patterned, does it "allow" free will? "It’s almost incomprehensible to consider that there could be a mathematical expression that explains mass human behavior. That is the most fascinating aspect of the Wave Principle. People are a long way from accepting it as a possibility in the social sciences. Still, this is not determinism. As individuals, we can unquestionably exert free will. But the style of behavior of the crowd is entirely different from that of an individual. It is based upon unconscious mental processes, not reason... Collective psychology is impulsive, self- generating, self-sustaining and self-reversing. Almost everyone believes that social actions cause changes in social psychology. If that is true, then events must be so perfectly determined that they create the Elliott wave patterns we see in the markets. For people to claim that the latest idea from the White House...or the latest statistic on the trade deficit or earnings or war or natural disaster has any effect on the market’s pattern, that such things are determinants of stock prices in any way, is suggesting a far more radical view of the harmony of the universe than I am. In other words, to argue that events cause the state of social psychology is to argue that events are patterned, which is determinism. In that case, free will is invalid, in which case no one could make money from the Wave Principle, which we have shown can be done. On the other hand, if social psychology guides the tenor of social actions, then it is only mass psychology, which is apparently a process governed by the unconscious mind, that need be patterned to produce structure in markets." 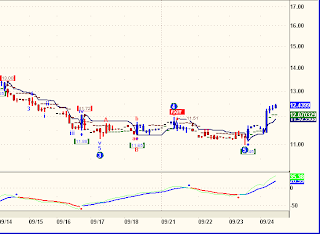 These are Leveraged Inverse ETF's, thus holding them long is a way to short their underlying indexes. 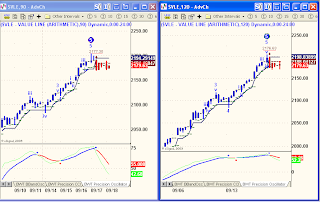 Both of these above charts include wave counts and False Bar Stochastics that add forecasting hints, but for trading purposes they are not nearly as powerful as the trend models. Goldman Sachs has become the poster boy for financial fraud and profit. 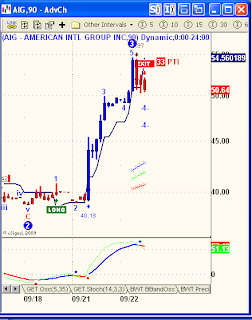 As the above chart illustrates, it is setting up a mechanical Type II Sell Signal in Advanced GET. 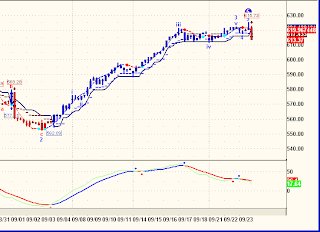 I used to base the triggers on trend regression channels, but now use Blue Wave and/or ATR to time entries. In any case, with both the SPX and GS precariously close to issuing Sells, it is hard to imagine one triggering without the other. Whichever goes first, bodes ill for them both. I'm aware that a lot of traders are liking Gold in here, but I remain skeptical. First, bullish sentiment is up around 90% Bulls. If that is not enough, the above chart suggests a reluctant uptrend......nothing impulsive about it. 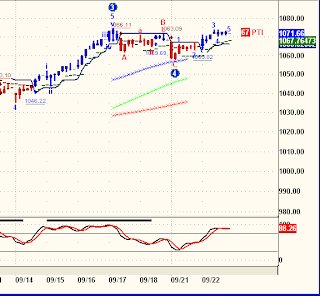 Finally, a fresh look at the RUT index discussed a few days ago. 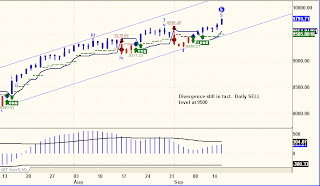 Uptrend still in tact, but Sell threshold levels not far below. 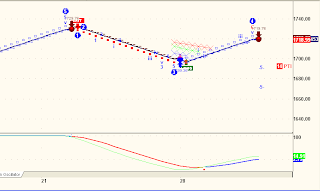 High volatility stock went negative on the 90 minute analysis earlier this morning, has a lot of white space below if it can build some downward momentum. I'm looking at this as a qucik scalp that could turn into a longer term swing trade. Risk here is about 2 points, reward between 6 and 10 points. Two major technical forces are about to collide in the S&P 500. 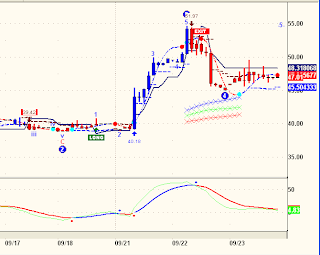 As I pointed out before, 90 minute charts bridge my intraday to swing trade models. 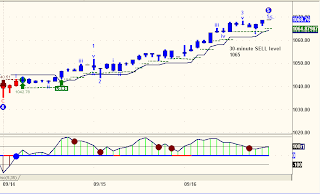 The above 90 minute chart of the RUT illustrates the difficulty of trading in-between markets. It looks like it wants to go down, but won't. I tried and failed to link this chart in your web posting box ...so I'm mailing it to you. I'm not too savvy with the computer. anyway, its about the time period June top to July bottom that was a big turning point for the analysis of "5 waves down" wave 4 should have peaked at this point and blown down past march bottom. 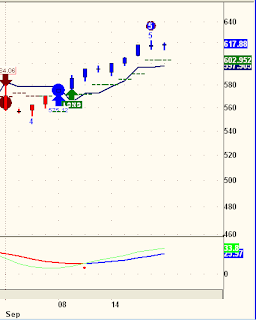 but it held there at the green line ....looks like about 475 on the chart. 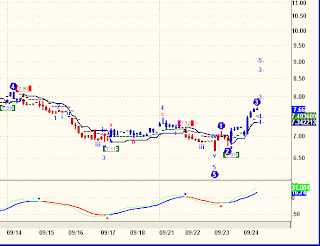 and held again ,as a double bottom in early July. Its been up from there. .......which I read as being a complete change of ...'5 wave down action'.....the current wave up from march bottom, or from this july bottom, is not characteristic of any wave 4 of 5 waves down. 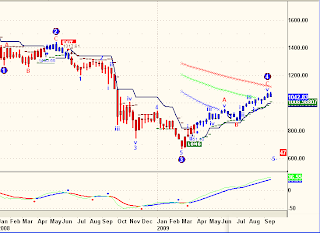 It does look like it can be a wave A of (an intermediate ?) a-b-c.
and if it was a 'wave B' of a larger A-B-C (down), then that could make sense as well. I see it as either /or (both)... wave A to target area 1150-1200 ending wave A up...wave B back down to the July Low...and wave C back up to the 1150 top. If it was Prechter's wave 2 (of 5 down).....or wait, maybe you're thinking it's a wave 4? of Prechter's 5 waves down?? is that what you see?? ....let me think on that....does a true wave 4 move more sideways in zig zags...bigger zig zags could happen, and if it is stretched out over a longer time period, could incorporate several zig zags in a range from 8oo to 1200 (s+p)...geez I think I'm mixing different charts now....oh gawd.... do you get 100 of these emails a day ?!. you should have stayed a lawyer. Anyway, what I'm thinking is -- I could see a very plausible and predictable scenario where the government game controllers engineer the market movement to do exactly this, a safe sideways slide in a safe range for quite a while , in order to allay the shock and trauma that investing public has suffered last year.... they need to stretch it out, before they allow or orchestrate the next giant crash that prechter is looking for. ....depending on how long they want to stretch it out to the new year. Psychologically, it just doesn't make sense at this time, while public investors are just beginning to re enter the market.... the Game Controllers would be shooting themselves in the foot to allow the markets to crash now. Just as they have been engineering this whole phoney 'recovery' all spring and summer, you see all the stick saves, etc... well, why would they stop controlling it now. J.S.Kim, one of my newsletter advisers (you can find him on seeking alpha) thinks that the govt. controllers WONT be able to control the market when the public starts increasing the volume now. I'm not sure I agree with that. but we will see as it plays out. So it will be interesting to see what plays out heading into the new year from here. I think a long sideways wave 4 is what they want to engineer now. Every important analyst is expecting a brutal move down... so I'm watching to see the government keep it under control and 'defy' the economic logic once again. their smoke and mirrors power must be very strong. to be able to engineer and control the global markets like this. I dont trust the government game master for a second, but I also dont want to 'bet against them' until I see that they have lost their grip on the controls. In any case, I am looking for a wave A top at 1100 followed by a wave B down to the august 17 bottom,or worst case july bottom, followed by wave C up to the 1150 area again....and maybe a repeat of the whole thing in the first quarter 2010. I see the USD doing the same dance. 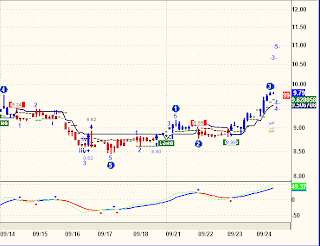 in a range from EUR/USD 147 top down to 137-138 bottom....ranging 137-147 with 142 as a middle balance point. If you look at the EUR/USD since last jan 2008 , look at the top july 2008 at 160, the bottom at 124.....right inbetween at 50% fib is ......142. Thats what they want to engineer for the time being. It's all a Rigged Game. I love analyzing elliot waves....but I think these days a better analysis is to analyze the Rigged Game.How would you engineer this Rigged Game if you were on the game rigging team? thats the question I ask myself. Your web site is one of the most important to me. keep up the good work. put that hockey photo of yourself back up. did you play for the redwings?? TZA is the 3X leveraged RUT inverse ETF, it should match the above gains of TNA in the likelihood of that steep decline. 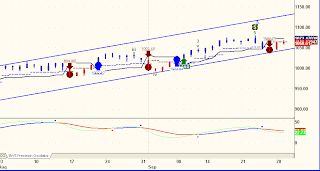 This RUT SELL SIGNAL on the Daily chart has not yet been triggered, but if and when it is, there may not be a lot of time to figure out how best to trade it. File this one away, if and when it is needed. Like them, hate them, fear them, or regard the whole idea as preposterous, a fiction, a colleague of mine in The Priory sent me a long Platinum play in late May . It generated over 30 responses, mostly calling the group “fake” and worse. Some even directly attacked me and my friend, whom I’ve known as a Priory member for over 20 years. 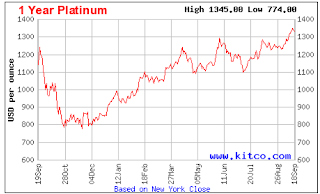 On June 5 Platinum closed at 1282.50 a rocket’s jump from the original post on May 23, 2009 when the first Priory post went up on this board when you would have bought in at 1175. 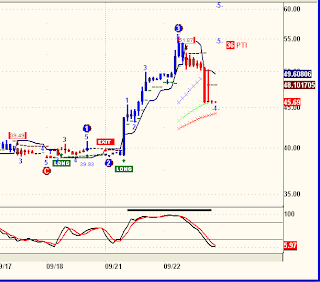 "Post went up on May 23 but could not be traded until May 25, Platinum was trading at about 1175 for the metal. 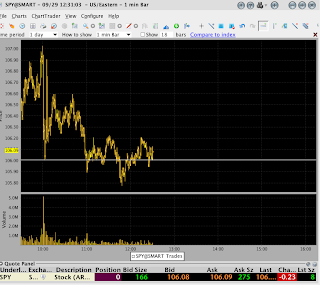 It closed today at 1293. 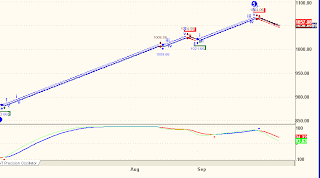 "Each full point represents $50.00 in gains, thus 1293-1175= 118 points * 50= $5,900 in profits since May 25 or 73%+ in 10 trading days or 7.3% per day or about $590/day." At $50 per contract (margin $8,100) per point we made: $8,650 or 106% in approx 70 trading days or around 1.24% per day over about 85 trading days or about 300% per year annualized. If you had added to your position on the second signal, the add-on would be worth 1348-1293=55 points *50/point= 2,750 on position number two over about 76 days or 33.9% or 0.45%/day. That is 107% per year annualized. Overall if you had gone long on contract each time you would have made 7.3% for the first 10 days and 0.45% for all trading days after that. So you would have made 73% for the first ten days and 33.9% for the next trade. Or 73% for 10 trading days and 33.9% for 76 trading days. That’s 73% for 8.6% of the time frame and 33.9% for 91.4% of the time. Assuming 240 trading days in a year that’s 73% *8.6%*240= 15.06 annualized. Plus 0. 0.45%*91.6%*240= 98.9% annualized. 98.9% + 15.06%= 113.96% per year or about 9.4% per month or just under $1,600/month with two contracts. I know this looks complex and we are estimating a few things but we now have almost 5 months of data to back The Priory’s trading methodologies up. 1) You asked me to keep you informed so I am. 2) Although you cannot trade their methods it shows there are many ways to make big $$ out there and no single formula. 3) By their own claims, The Priory’s wealth is immense and its power unimaginable. 4) I know these guys, or at least a few of them, or at least what they claim to be. 5) Again, for whatever it is worth, the Platinum idea is but one of many ideas that these folks have brought to me over the years. Some day I'll write up the first one. which was given to me in return for some legal work done in the late 1980's. It's a great story, but I'll save it for another time. The middle chart is GLD, for the hordes of Gold Bulls out there.....you know who you are. 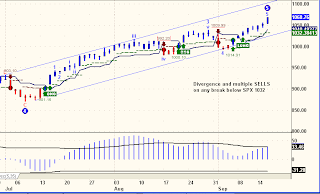 The above charts address the Intermediate trend. 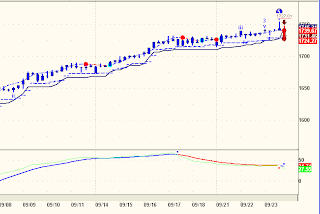 When these models flip to SHORT, I will consider the Intermediate trend in play. Note the the process has apparently already begun. Also note the bottom indicator. 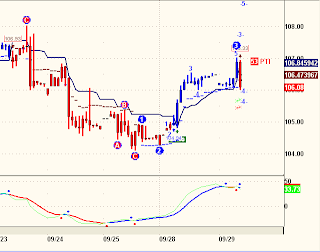 This is proprietary to Blue Wave, called the Blue Wave Trading Precision Oscillator. 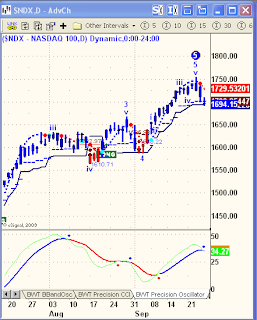 Click on the charts to enlarge and study the indicator, especially how it correlates with the Blue Wave Trading and ATR models on the price chart. I believe that you can learn more from observing then I can share with you by describing. For now, as of mid-day Thursday, the short-term uptrend is broken.